Heat oven to 400°F. Place margarine in ungreased 15x10x1-inch baking pan. Place in oven; until margarine is melted. Remove from oven. Tilt pan to coat with margarine. Meanwhile, cut chicken breast halves in half lengthwise. Cut crosswise into 1/2-inch slices. In large bowl, beat eggs; stir in chicken and 1/4 cup of the picante. In shallow bowl, combine bread crumbs, salt, cumin, chili powder and oregano; mix well. Add chicken pieces to bread crumb mixture, a few at a time; turn to coat. Place coated chicken in margarine-coated pan. Bake at 400°F. for 15 to 20 minutes or until chicken is no longer pink in center. Reserve 1 tablespoon of the green onions for garnish. In large bowl, combine remaining onions, salad greens and tomatoes; toss gently. Pour half of the salad dressing over salad; toss to coat. Arrange evenly on 8 individual plates. 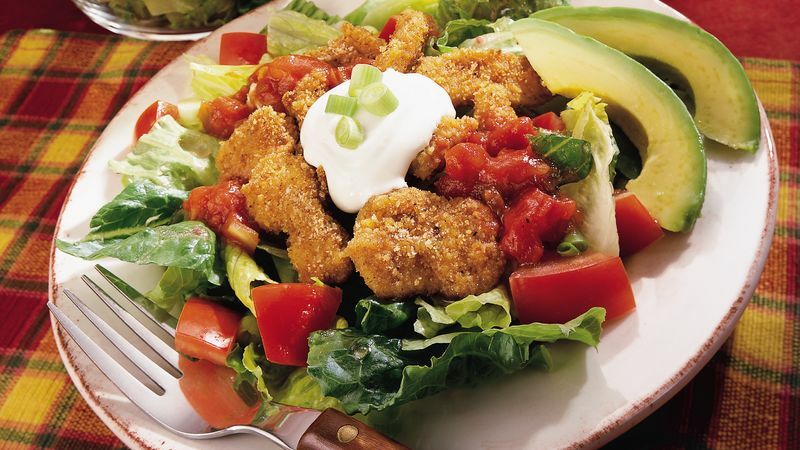 Spoon chicken onto center of each salad. Top each with 1 tablespoon sour cream and about 1/2 teaspoon reserved green onions. Garnish each plate with avocado slices. Serve salads with remaining half of salad dressing, 1/2 cup sour cream and 1 cup picante.